If the mango is the Aishwarya Rai Bachchan of the Indian fruit world, dazzling and international, perhaps a little over-exposed, then the poor old mulberry is the shy unmarried sister left behind in the village to look after granny, with only cowherds to marvel at her fragile beauty. In the past few weeks, the Alphonso has embarked on her annual red carpet rounds in London, Paris and New York, barely batting an eyelid at all the gushing and fawning. At around the same time I noticed the short, sweet mulberry season had started: There was no trending on Twitter, just a few purple splats on the car as the soft berries started to fall from the tree on our street. Mulberries came to India from Persia—William Finch, a traveller in 1610, noticed “from Agra to Lahore, a distance of 600 miles, the way is set both sides with mulberry trees”—and are chiefly used in silk cultivation; their leaves are the sole food of the silkworm. The intensely sweet and fragrant berries are also incredibly delicate, preferring not to stray too far from home. Mangoes can be packed and despatched thousands of miles—they’re one of the harbingers of spring on our street at home in Scotland—but mulberries, best eaten on the day they are picked, will always be a very local luxury. And for me, the fact that I’ll never see mulberries in Tesco in Edinburgh makes them all the more exotic and desirable. They look like a long thin blackberry and taste like a cross between a blackberry and a raspberry but with a hint of harem decadence, conjuring up afternoons whiled away by tinkling fountains. This week, though, mulberries proved elusive in Delhi. I didn’t fancy shimmying up the tree opposite my house, my man at INA market said there wasn’t much call for them and responses to a plea on Twitter directed me to forests on the edge of Delhi and roadside vendors in Uttar Pradesh. Finally, I had to make do with some rather forlorn-looking shrink-wrapped trays of mulberries from Khan Market. They may well be at their best eaten straight from the tree with purple juices staining fingers and clothes but after gorging extensively, I just couldn’t resist giving this subtly exquisite fruit its 15 minutes of fame in my kitchen. Along with her friends from the village, chaach (buttermilk) and ghee (clarified butter), my ruddy-cheeked mulberry made the most wonderful, fluffy breakfast dish. It was her time to shine and these rich, light and fruity pancakes would certainly be enough to turn any potential suitor’s head. Remove the stalks from the mulberries—the fruit will break up a little but this won’t matter. In another bowl, beat together the buttermilk, ghee and egg yolks. In yet another bowl, whisk the egg whites until stiff. Add the buttermilk mixture to the flour and stir very gently (no beating or whisking) to just incorporate the flour. Then gently fold in the stiff egg white—don’t worry about making a smooth batter, that’s not what you need here; in fact the less you mix the ingredients, the fluffier the pancakes will be. Melt a small amount of ghee in a non-stick frying pan or griddle over medium heat. Take a tablespoonful of batter and drop it on to the pan, then sprinkle a few mulberries on top. Leave for a couple of minutes until the bottom is golden brown, then flip over and cook for a further couple of minutes. Serve the pancakes hot with maple, or even mulberry, syrup and a few fresh berries. The batter will keep for a day or so in the fridge. Superb! Just Superb! Have to make this!! We used to have a mulberry tree at our grandfather’s house. Oh my. I’ve never had mulberries, only read about them in fiction and they’ve always intrigued me. Hanooz, Dilli du ast is all that I can say. Really miss this! I was so jealous of haridwar people when i saw khomchas of this fruit being sold there , why Delhi khomcha walas are not doing us a favor ? Mulberries in pancakes..have never gone further ..than eating them as it is. Love the recipe and hoping to get my hands on these berries soon. Kathy – I don’t really know what happened to all the mulberry trees – we grew up on mulberry-centric nursery rhymes! Sassyfork – have to be quick – season nearly over! Sangeeta – the guys at INA say there’s not much call for mulberries these days! Sangeeta kk – good luck! Hope you are feeling better and are up and about now. I have been hesitating to make your Nankhatai cheesecake for a while now because it seems hard to get that whole water bath thing right. But with mango season underway here, I am wondering if its worth trying it as a Mango cheesecake (just sliced a mango topping). What do you think? Hi Saumya The water bath sounds more complicated than it is. The easiest way is to boil a kettle. Put the cheesecake in a roasting tin then place the tin in the oven. Then pour the boiled water into the tin about halfway up the sides of the cheesecake tin then close the oven door. Mango version sounds wonderful – saw lots of beautiful mangoes in Old Delhi at the weekend. Good luck. First visit to your blog, Pamela. It is wonderful! Great to find out what can be done with mulberries, at last…. Have worked, over the years, in gardens where mulberries grow and the fruit has always been left where it falls. John Eveleyn wrote in the sixteenth century that tender plants shouldn’t be placed outdoors until the mulberry ‘sheweth its leaf’. I always follow that advice: no matter how early or late its leaves show, it’s never let me down. I should have said that I live in England, in the Cotswold Hills! Mulberry time is late summer. Can’t wait to try out some recipes – at the moment addicted to the rhubarb season…. Johnson – if I miss one thing in the food department it’s rhubarb! 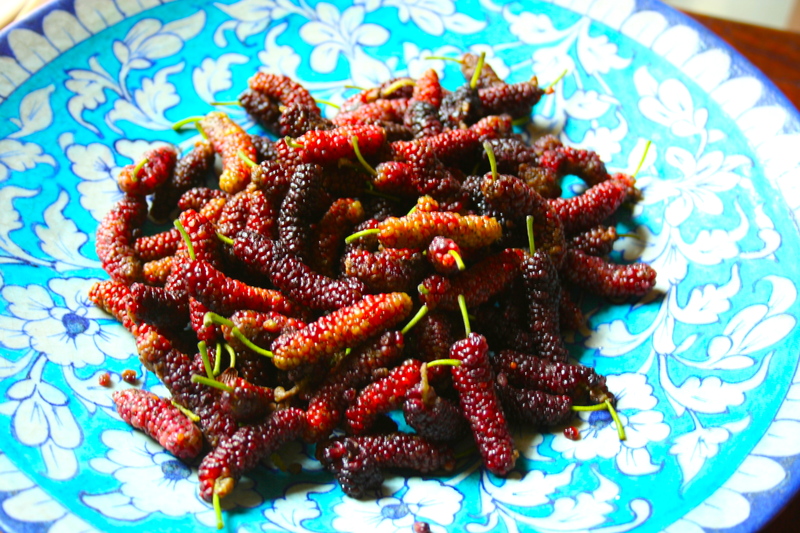 ahh mulberry…..mulberries in hindi are called shehtoot! I luv them. More maroon or deep red colour they are, more sweeter they will be! the very soft ones along with deep red colour will give u heavenly taste! Vanand, I know, I’m a bit obsessed with shatoot – such a short season though – they’ve gone in the blink of an eye! I live in British Columbia , Canada, and we have a mulberry tree at this residence where we rent. It’s the first time, I had ever had anything to do with mulberries. I only recognized the name from children’s books and rhymes.